Historically, Scotts Bluff is primarily known for its importance to the westward migrations of the mid-19th century. At that time, the area was most noted for its striking geological features—from the spectacular natural monument of Scotts Bluff, an imposing rock face jutting over 800 feet skyward from the flat terrain of the Nebraska plains, to the remarkable spire of Chimney Rock. For many western travelers, weary from mundane and exhausting overland travel, the change in topography was a welcome respite. Few towns in western Nebraska pre-date the railroads. The limited settlements were largely concentrated around military forts--Fort Sidney, Fort Robinson, and Fort Mitchell--as well as Pony Express stations and trading posts. The earliest permanent white settlements in the region were cattle ranches and farms. By the 1870s, the North Platte River Valley was a prominent grazing land for open-range cattle. Most of the valley’s cattle were Texas longhorns, driven up from Texas after the Civil War. Opportunities for employment on cattle ranches lured many of the region’s earliest pioneers to the Scotts Bluff area. With few permanent homesteads in the area, cattlemen generally had free reign to graze their livestock on the public domain throughout the region. However, by the 1880s, farmers began to take ownership of land under the Federal Government’s Homestead Act of 1862, which allowed settlers to claim 160 acres of land on easy terms. While settlers could easily obtain land under the terms of the Act, pioneer life on the western Nebraska frontier was not for the weak-spirited. Though undaunted by earlier reports of sandy soil and scarce water, homesteaders discovered that growing hearty crops was a difficult task when winters were harsh and summers were hot. On the Nebraskan plains, the treeless horizon was visible to the gaze in all directions for miles and miles. To combat isolation, pioneers often forged communal bonds with distant neighbors. Some early homesteaders came to western Nebraska completely unprepared for the difficult task that lay ahead. Lacking equipment and stock to improve their land, they relied on neighbors, sometimes swapping their labor for the opportunity to borrow farm implements. Even many of the adequately prepared homesteaders found it necessary to obtain additional income to what their farms provided. The terms of the Homestead Act allowed claimants to leave their homesteads for up to six months a year in order to procure work, and many early settlers made full use of this clause. They travelled as far as Wyoming or Montana to work on cattle ranches and then returned to their homesteads, money in hand, to improve their claims. Due to the lack of adequate timber in the area, many early homesteaders lived in crude sod dwellings. Soddies, as they were known, were damp, dark, and small, often forcing large families to live in only one or two rooms. What the sod houses lacked in material extravagance, however, they more than made up for in utility. Sod was a good insulator and kept the houses cool in the summer and warm in the winter. Because of the limited timber reserves, pioneers turned to auxiliary forms of fuel to warm their soddies or prepare their food. Settlers often used cow chips, the dried dung of buffalo or cattle, for fuel. Found in great abundance throughout the area, the chips gave off little smoke and provided heat for warmth and cooking. Rain fell sporadically on the plains, and the total amount of precipitation varied greatly from season to season. Even a relatively minor period of drought could devastate a farm. During the early 1880s, western Nebraska farmers witnessed a prolonged drought that stretched nearly a decade, devastating even the most successful farmers. Frustrated by the lack of water, but convinced that with properly watered fields farming could be successful, farmers turned to costly—though effective—irrigation projects to ensure an always available water supply. Because of local farmers’ determined efforts, limited crop cultivation in the region was successful and, in time, more settlers came looking to claim homesteads. By the turn of the 20th century, local farmers embarked on a series of ambitious irrigation projects, and numerous privately operated canals and irrigation ditches crisscrossed the North Platte River Valley. The population of homesteaders in the area skyrocketed when the Federal Government passed the Newlands Act, or Reclamation Act, in 1902. The act provided Federal funds to construct expensive, permanent irrigation works to reclaim the Great Plains soil. Another Federal law, the Kinkaid Act of 1904, that Nebraska Congressional Representative Moses Kinkaid sponsored, further bolstered population growth in the region by allowing homesteaders to claim 640 acres of land. With a stable water supply and large sections of cheap land available to farmers, the North Platte River Valley quickly rose from a backwater area used primarily for grazing open-range cattle to rapidly settled farmland. 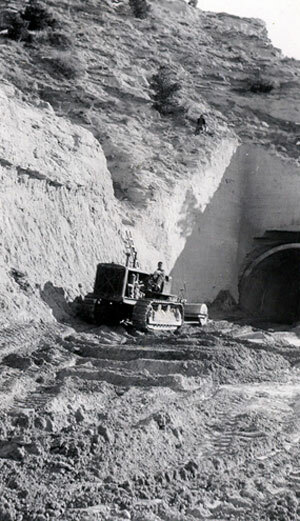 Scotts Bluff Tunnel Under Construction by the C.C.C. Increased settlement and farming attracted the eye of profit-seeking railroad companies eager to tap budding freight and passenger markets. Seeking new opportunities in western Nebraska, railroad companies platted Gering and Scottsbluff. These became the two largest towns in Scotts Bluff County. The city of Gering was originally founded in 1886 by Oscar Gardner, and named in honor of German immigrant and banker Martin Gering. Although officials from the Union Pacific railroad platted the town in 1887, the railroad did not lay tracks until 1910. With a growing population and the promise of a major rail line, settlers in Gering and the surrounding region began to demand political recognition in the late 1880s, arguing that Cheyenne’s county seat at Sidney was too far away to efficiently serve much of the county’s population. In November 1888, following local elections, Scotts Bluff County officially split from Cheyenne County, and voters selected Gering over Mitchell as the new county seat. 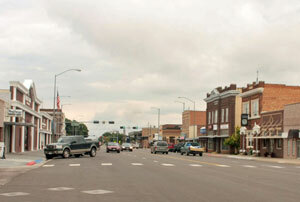 Following Gering’s designation, the city experienced sustained growth. This period saw the first brick buildings in the town erected, a jail built, and the establishment of numerous churches and civic organizations. 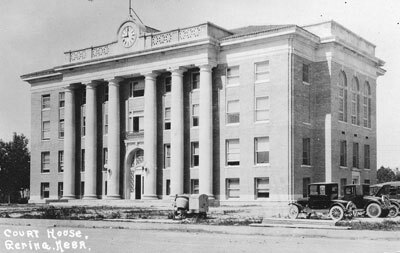 In 1921, Gering constructed the Scotts Bluff County Courthouse that is still in use today. Just north of Gering across the North Platte River, Scottsbluff became the region’s first town located on a railroad line. The Lincoln Land Company, a subsidiary of the Burlington Railroad—the main business rival of Union Pacific, founded and platted the town in 1899. By 1900, Burlington Railway laid tracks into Scottsbluff and placed a discarded boxcar alongside the track to serve as a depot. 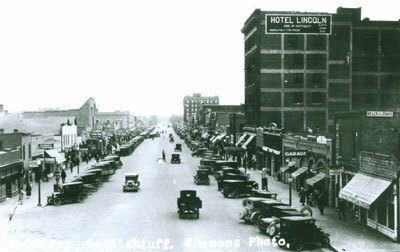 Within three months of the introduction of rail lines into Scottsbluff, the nascent community became an incorporated village, and some older Gering businesses relocated to the higher-trafficked town. The railway line was an economic boon to the entire region. Settlers could now easily travel to and from the remote region, and farmers could supply distant markets with their perishable goods. Throughout this period, local businessmen also made concerted efforts to attract homesteaders to the area. The Scotts Bluff County Land & Immigration Company printed and disseminated pamphlets lauding the area’s agricultural potential. They also visited local and State fairs to preach the gospel of irrigation and try to influence visitors to the fairs to move west. By 1910, business in the town boomed. Economic prosperity led to an increase in population. Growing into a single urban community by 1950, Scottsbluff/Gering had become the economic hub of western Nebraska. As the cities’ regional importance increased, Scottsbluff and Gering constructed new civic and public buildings. Scottsbluff was one of several Nebraska towns to receive a Carnegie Grant, which facilitated construction of the Scottsbluff Carnegie Library between 1921 and 1922. In 1931, Scottsbluff erected the monumental Scottsbluff Post Office, a far cry from the old days of the Pony Express. Scottsbluff/Gering boasted four local papers. Local news dailies, the Scottsbluff Republican, Scottsbluff Herald, Scottsbluff Star, and Gering Courier informed citizens throughout the county of local and national news. The Star and Herald later merged to produce the Star-Herald, a local paper that, along with the Gering Courier, is still published today. For entertainment, townsfolk could attend the opera at the Marquis Opera House, constructed in 1910, or the Egyptian Theater, an extravagant movie theater. When the Egyptian burned down in 1945, the modernistic Midwest Theater rose in less than a year later to take its place. Now renovated, the theater remains a valuable cultural asset in the community. Scotts Bluff County’s long relationship with transportation continued through the early 20th century. Constructed in the 1910s, the Henry State Aid Bridges were part of a major state-funded operation to promote bridge construction. New Deal-sponsored programs in the 1930s created Summit Road, the narrow road that traverses the summit of Scotts Bluff. The Civilian Conservation Corp (C.C.C.) and other government agencies built the road during the height of the Great Depression. Summit Road is Nebraska’s oldest concrete road and boasts the State’s only passenger vehicle tunnels. In the 1950s and 1960s, controversy arose in Scotts Bluff County with the Federal Government’s proposed plan to rout the interstate highway, which later became Interstate 80, south of the Platte River. Because local citizens feared that such a route would adversely affect the region economically, Ogallala, Oshkosh, Gering, and Scottsbluff all passed resolutions urging a more northerly route. The State of Nebraska endorsed the Scotts Bluff region’s resolution, but the Federal Government opted for the more cost-effective southern route. Although the Interstate Highway System bypassed Scotts Bluff, the region’s fears of economic decline and isolation were never realized. Today, Scottsbluff and Gering are accessible by Nebraska Highways 92 and 26, both of which are part of the Scenic Trail Historic Byway. Current road construction plans call for connecting the recently completed John McLellan, Jr. Expressway—the four-lane highway connecting Scottsbluff and Gering—to the larger network of the Heartland Expressway. When completed, the Heartland Expressway will be a multi-lane divided highway that will connect Rapid City, South Dakota, to Denver, Colorado, via Scottsbluff. The Heartland Expressway is but one component of a much larger transportation network known as the Great Plains Trade Corridor. When all sections of the corridor are finished, the highway complex will link many cities and trading centers on the Great Plains to the rest of the United States and parts of Canada and Mexico. The region’s main economic strength continues to rest on agriculture, even as recent growth in food processing, retailing, manufacturing, and health services add to the prosperity of the region. Tourism has also contributed to economic growth. Some of the tourist sites in the vicinity are Scotts Bluff National Monument, Chimney Rock National Historic Site, Agate Fossil Beds National Monument, numerous local museums, and the Riverside Zoo. Today, the Scottsbluff/Gering area is the economic hub of the entire Nebraska Panhandle. As of 2007, Scotts Bluff County boasted a population of more than 37,000 people, making it Nebraska’s sixth most populous county.